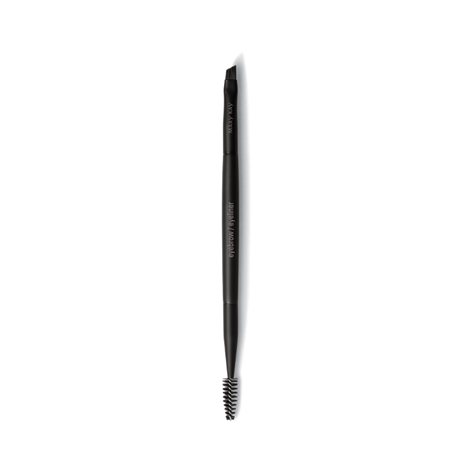 Tame brows, fill in sparse areas and precisely apply eyeliner with the Mary Kay® Eyebrow/Eyeliner Brush. Wired spoolie on one end and firm, angled brush on the other. Bristles gently grip product until you place it where you want it. Brush is compatible with cream and powder formulas. The wired spoolie end can be used to tame brows or blend color. The firm, angled end of the brush provides precise application of eyeliner or can be used to fill in brows. For brows: Tap the angled brush in powder, and use short strokes to fill in brows. Brush through with the wired spoolie in the opposite direction of growth before brushing brows upward and back into place. For eyeliner: Tap angled brush into color, and use short strokes to apply. Starting at the inner corner of the upper lashline, work outward using light strokes. Repeat on lower lashline, if desired.